A New York Times Editor’s Choice. A Powells.com staff choice and bestseller. Into our trash cans go dead batteries, dirty diapers, bygone burritos, broken toys, tattered socks, eight-track cassettes, scratched CDs, banana peels … But where do these things go next? In a country that consumes and then casts off more and more, what actually happens to the things we throw away? 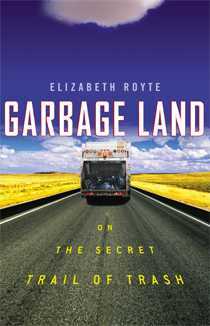 In Garbage Land, acclaimed science writer Elizabeth Royte leads us on the wild adventure that begins once our trash hits the bottom of the can. Along the way, we meet an odor chemist who explains why trash smells so bad; garbage fairies and recycling gurus; neighbors of massive waste dumps; CEOs making fortunes by encouraging waste or encouraging recycling–often both at the same time; scientists trying to revive our most polluted places; fertilizer fanatics and adventurers who kayak among sewage; paper people, steel people, aluminum people, plastic people, and even a guy who swears by recycling human waste. With a wink and a nod and a tightly clasped nose, Royte takes us on a bizarre cultural tour through slime, stench, and heat-in other words, through the back end of our ever-more supersized lifestyles. By showing us what really happens to the things we’ve “disposed of,” Royte reminds us that our decisions about consumption and waste have a very real impact-and that unless we undertake radical change, the garbage we create will always be with us: in the air we breathe, the water we drink, and the food we consume. Radiantly written and boldly reported, Garbage Land is a brilliant exploration into the soiled heart of the American trash can.